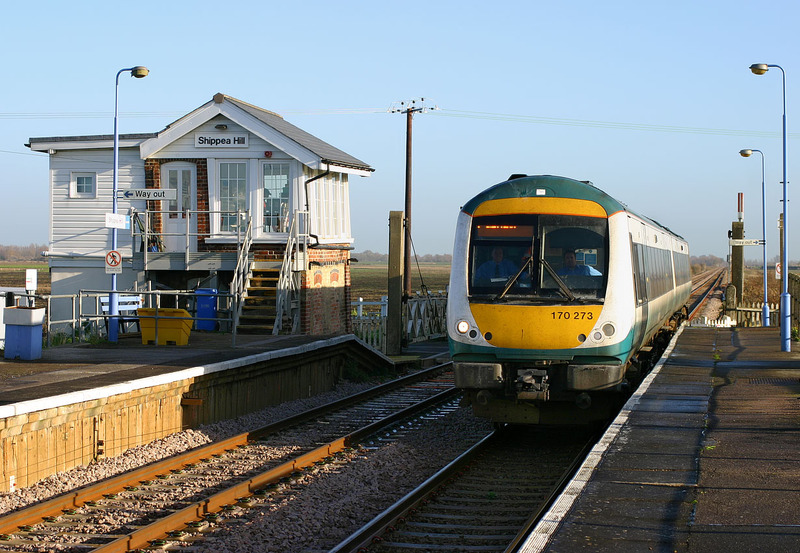 Shippea Hill station is situated in the middle of the fens, where the Littleport to Mildenhall road crosses the Ely to Thetford line. With only a few scattered farms in the vicinity passenger traffic is virtually non-existence, not helped by the fact that only one train calls in each direction per day. The two units per hour that make up the normal service merely rush through at speed, as in the case of 170273 seen here with the 10:40 Norwich to Cambridge One Railway service on 29 November 2006. The signal box, which when viewed from certain angles has a definite backwards lean, has had a modern extension added to the rear.